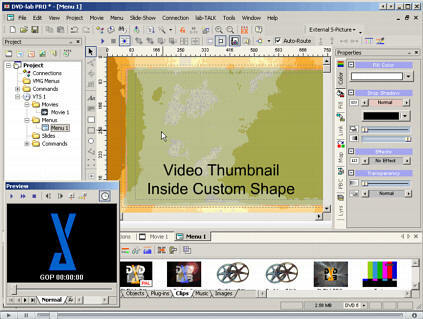 Too many DVD authoring packages on the market are restrictive, forcing the user to use pre-set DVD templates which might not suit a variety of situations. Ease of use and a wide array of options is the hallmark of DVD-lab, placing it above and beyond the competition. Most of the consumer DVD authoring tools underestimate users by holding their hands while guiding them through the DVD authoring process. 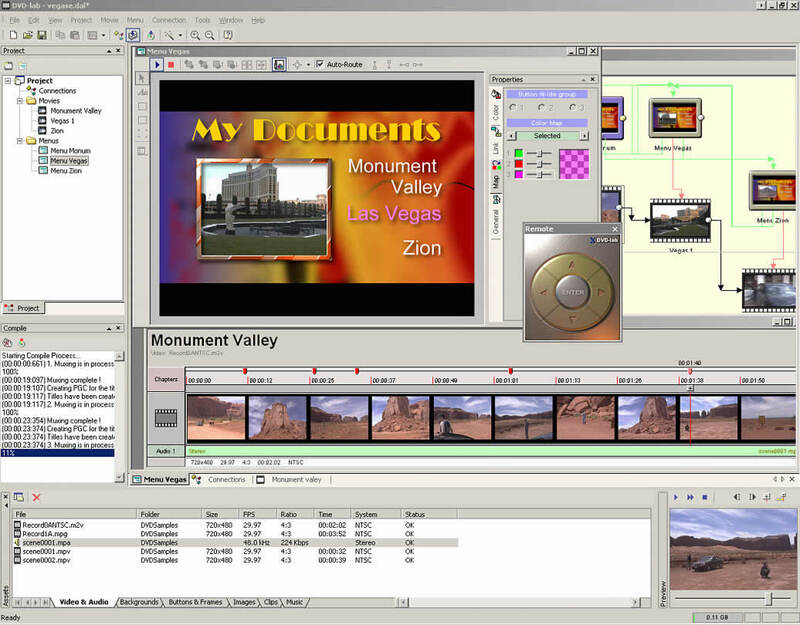 DVD-lab was our first "entry" level authoring tool. A solid interface and a great flexibility that gained quite following on the web boards and earned us many great reviews in magazines. The software will surprise you by its overall speed and light feel. 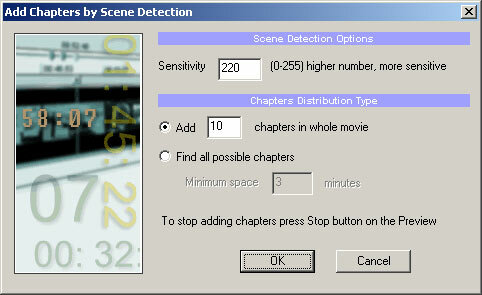 Scrolling through a movie and adding chapters is a breeze. While you compile the movie you can actually do other things, even work on other DVD. It has integrated menu creation, connection module and DVD burning module. It doesn't hide from you advanced aspects of DVD creation yet it covers your back. For example it does Auto-Routing for buttons on menu, but you can switch it off and route the buttons as you like. ** In practical terms you can have 99 titles across the whole DVD. However each title can be divided into smaller segments that can play as separate movie which gives us maximum 9801 of such segments per DVD. DVD-lab never re-encode your files. This was our first important decision and it is in the style of all high-end authoring tools. First you have to prepare the video and audio files using any of your favorite software or hardware encoders (we also sell some) and then add it to the DVD-lab. DVD-lab quickly checks and verifies the validity of your files and then you can start creating the DVD. The whole DVD compilation lasts just few minutes. This is important when you are making a professional DVD. You will likely want to change the DVD flow few times and short compiling times are essential. DVD-lab therefore support all DVD specification files: MPEG2 for video and MPA, AC3, DTS, LPCM for audio including multi-channel audios. Is PRO version much more difficult than Standard? Our goal was to make software that offers full scale of features but yet doesn't necessary require you to understand them all at once. DVD-lab PRO allows almost immediate jump-start. No need to absorb every detail. The idea is that you learn as you go and start using more advanced features when you need them. If you can work with Standard version you can work with PRO for sure. Is Studio version more difficult than Standard? No, we kept the look and feel of Standard version without any un-necessary clutter, but added some new features from PRO version, like increasing number of audio tracks or adding Play All and Return to last menu. How fast can I create my very first project? In 10 minutes. Just read the one page quick tutorial. This apply to both Standard and PRO. Why the PRO version has two kinds of menus (VTS Menu and VMG Menu)? Because DVD specifications has two kinds of menus. Many other advanced authoring software pretend they have only one type of menu to be "easy" on users. Then, behind your back they place the menu to VMG or VTS domain depending on the most probable situation. That's simply wrong. The true value of advanced authoring application is that you are in the control, not the application. We had to learn it as well. You don't need to understand any of this in PRO because the software will teach you. For example you will be happily building your DVD's for months the simple way. Movies, menus then link. Then one day you will add both 16:9 and 4:3 movies. When you compile the software will tell you - sorry but you have to put each movie into separate VTS. Soon after that you will discover the need for VMG menu. Learn as you go. Do I have to use/learn VM Commands for PRO? No. This was added for the more advanced users that need to create a very special structure. Unlike other software that use VM commands, in DVD-lab you don't have to even know they exist. But VM Commands allows you to go beyond advanced authoring. How complex is the created DVD structure in PRO? The Abstraction layer (or the DVD structure that DVD-lab creates) may be one of the cleanest you have seen. We use only few registers (GPRM11-GPRM15) in our AL for DVD-lab code (playlist, menu highlighting, return to last menu etc..), the rest is for you freely to use in VM Commands. We are very careful to create only the commands that are necessary for the project, so the DVD will be clean. No unused code, no large command structure that jump all over the place. Lean code. For special needs you can even switch off the Abstraction Layer can be switched off and start building your DVD in low-level. While the PRO 2.0 is the best deal for the buck (you can't get such features for the same money anywhere else) we also created Studio version that bridges the Standard and PRO. Still there is very straightforward upgrade policy between Standard, Studio and PRO. Important: When Entering registration code on Vista and W7, first run the DVD-lab Standard and Studio as Administrator (right click on icon - Properties, Security Tab, check Run as Administrator) then run it and enter the code. It is not necessary for PRO 2. 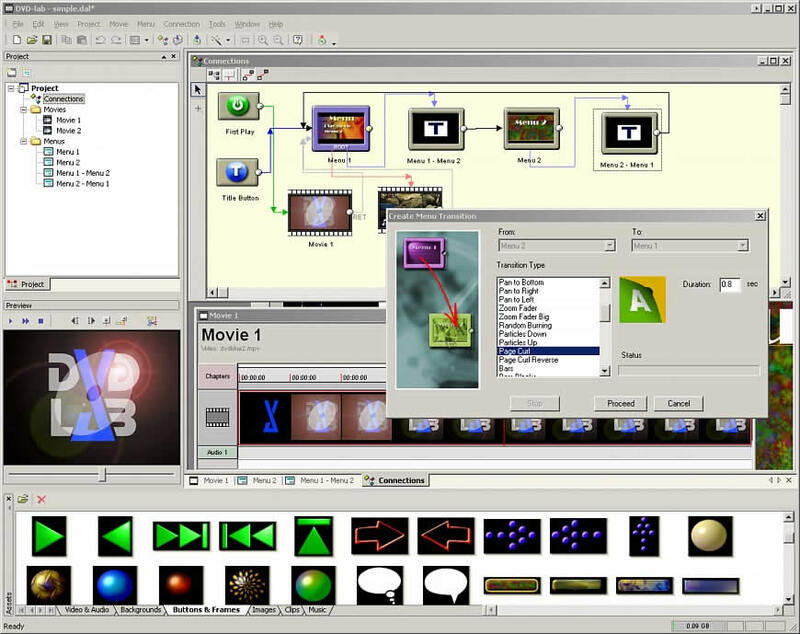 The DVD-lab PRO 2 version 2.31 (with compiler 4.00.42) had the longest period of testing with industry professionals (including many Hollywood studios) spanning over multiple years and therefore it earned status of "production standard". If you need the most independently approved version of DVD-lab PRO 2, this is it. This version includes the demux hotfix. This merges most of the new changes and fixes up to version 2.5 while still running the older production standard DVD compiler 4.00.42. Normally you should start with the 2.52 version and go to PSC versions if you start having issues such as memory errors when making multiple VTSs. The PSC 4.00.42 compiler is much smaller and so it will not that easily run out of the memory when producing multiple VTS. Note: You can run multiple versions if you install them to different folders. They all use the same registration code. 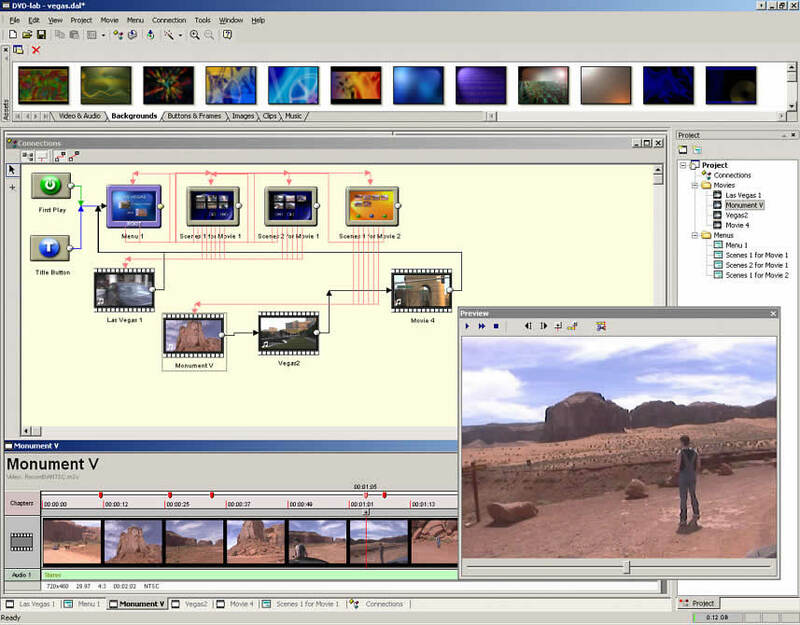 Read more about DVD-lab PRO 2. Important: When Entering registration code on Vista and W7, first run the DVD-lab Studio as Administrator (right click on icon - Properties, Security Tab, check Run as Administrator) then run it and enter the code. Important: When Entering registration code on Vista and Win 7, Win 8 , Win 10, first run the DVD-lab Standard as Administrator (right click on icon - Properties, Security Tab, check Run as Administrator) then run it and enter the code. Put a video thumbnail inside any shape. It can be used as a still or later render as Motion Menu. If you need a well tested lean MPEG2 encoder for your DVD projects we pre-purchased a rather large number of copies of DVD Source creator 2 from pegasys way back. This is old version 2.0 but it works extremely well for mpeg2. Get the file here (2.4 MB) and purchase here for only $12. 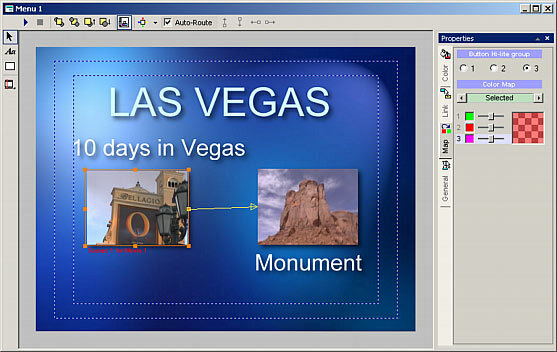 Smart way of changing aspect ratio for DVD-menu still images or digital photography. Read More here.